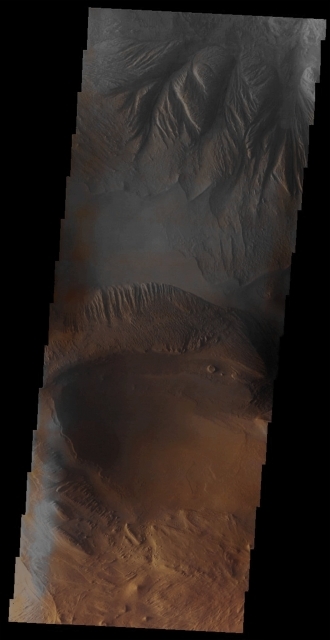 In this nice VIS image, taken by the NASA - Mars Odyssey Orbiter on May, 25th, 2003, and during its 6.407th orbit around the Red Planet, we can see a small portion of Candor Chasma. Candor Chasma is one of the largest Canyons forming the Great Valles Marineris Canyon System. This feature is geographically divided into two halves: East and West Candor Chasmas, respectively. It is still unclear how the Canyon originally formed, but one theory is that it was expanded and deepened by Tectonic Processes - similar to the ones that create a so-called "Graben" -, while another theory suggests that it was formed by Subsurface Water Erosion. Just out of curiosity, the upper part of the frame shows an unusually-looking color (---> light gray) because of the presence of a relatively thick Haze (---> made of Water-Ice Particles, Volcanic Ashes and Dust Particles, which are all) suspended in the lower Strata of the Martian Atmosphere. This image (which is an Original Mars Odyssey Orbiter falsely colored and Map-Projected frame published on the NASA - Planetary Photojournal with the ID n. PIA 19265) has been additionally processed, magnified to aid the visibility of the details, contrast enhanced and sharpened, Gamma corrected and then re-colorized in Absolute Natural Colors (such as the colors that a normal human eye would actually perceive if someone were onboard the NASA - Mars Odyssey Orbiter and then looked down, towards the Surface of Mars), by using an original technique created - and, in time, dramatically improved - by the Lunar Explorer Italia Team.